Happy new year! And with the passing of the holiday season, it's time to start looking forward to Spring -- with flowers and garden parties, and graduations and weddings. So here's a look at the work of my favorite artist, Karin Hope Dixon, who creates beautiful handmade origami folded-paper flower sculptures. You can find her classic -- and fanciful -- creations at her Etsy store (the marketplace for hand-crafted goods), including bouquets, earrings, and decorative ornaments. Or explore her Everlasting Blossoms site and dedicated Wedding site for your celebrations, including bouquets, boutonnieres, bridal showers, centerpieces, invitations, and place cards. You even can work with the artist to create your own custom designs -- based on your favorite theme, flowers, colors, papers, and accessories. I've been having fun demoing pocket camcorders for the holiday season -- These are so easy to carry, and still shoot quite good looking HD video. And they make great gifts, for example, to give to young adults heading off for school or vacation or a honeymoon. Though maybe you also deserve a great gift for yourself, so you can be ready to shoot and share fun events. The Cisco Flip Video pocket camcorder line has been very popular, for example, with carefully simplified devices like the Flip Mino HD that you just turn on and start shooting (see previous post). 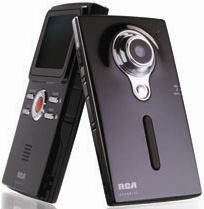 But other pocket camcorders like the RCA Small Wonder line take a different approach, emulating standard camcorders with a broad array of different models and designs, with a variety of added options and features including removable batteries, expandable memory slots, flip-out displays, and a DVD recorder dock. For example, the RCA EZ209HD Small Wonder 720p HD Digital Camcorder for $129 / $89 street shoots up to 720p HD video in a slim design (~ 4.3 x 2.5 x 0.9 inches, 3 ounces) -- amazingly thin with a bump-out lens. It shoots video at three resolutions: lower-res Web 320 x 320 at 30 fps, high-speed Sports 848 x 480 at 60 fps, and HD 1280 x 720 at 30 fps, stored as AVI files in H.264 format. This gives 8 to 40 hours of recording on a 16 GB card. Plus it shoots 8 MP still photos (extrapolated from 5 MP sensor), as 3200 x 2400 JPEG files. And it goes further into adjustability with lighting settings in the menu to optimize the exposure to the scene, for Auto, Outdoor, Indoor, or Low light settings. The EZ209 is easy to use, with a (relatively) large 2 inch LCD display with larger lettering for the on-screen display. And it has straightforward controls, with a sliding power switch, a three-position slider for clearly selecting the video resolution, and dedicated Play, Delete, Menu, and Photo buttons. The camera includes 256 MB built-in internal memory, plus a microSD card expansion slot for up to 16 GB. There's no flip-out USB connector, instead the camera has a miniUSB port for recharging the built-in (non-removable) battery, and for transferring data to a computer. The camera memory has pre-installed Memory Manager software to download and edit your videos, and share online. Or you can display directly on a television via the AV or HDMI connectors. In comparison to the Flip Mino HD, the display on the EZ209 seems muted, with less saturated colors. Yet the video itself is typically darker and extra saturated -- more red in a bright hockey rink, for example, or more yellow/green shooting on the Princeton campus. The Flip video also has more visible detail, for example in stone work in the background of the scene. Still, the EZ209 Small Wonder provides an amazing range of options in a small and light package. You have more control to experiment and refine, not only with the different video resolutions, but also with the lighting options in the menus for videos and photos. See my Holiday Tech Gift Guide 2009 for more on pocket camcorders and other fun gadgets. 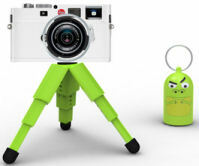 See my Digital Camcorders Gallery for more on pocket camcorders and other digital camcorders. Pocket camcorders have been popularized by companies like Flip Video (now Cisco) and RCA (now Audiovox) focused on personal and portable devices (see previous post), but the market is growing with entries from companies from professional imaging, including Kodak, Sony, and now JVC. The JVC Everio line of hard drive and flash memory camcorders has now been joined by a new Picsio line of pocket camcorders, with a light and compact design, colorful cases, and serious power: Full-HD 1080p video recording and 8 MP still photos. The JVC GC-FM1 pocket camera is $199, and comes in three colors (black ice, blue steel, purple passion), with a 2 inch display on a snazzy case with "jewel-like geometric pattern and chrome accents." It has a light and compact form, rectangular with rounded edges (~ 3 7/8 x 2 1/8 x 11/16 inches, 3.4 ounces), textured down the sides for a better grip. The Picsio shoots video in four resolutions -- widescreen 1080p (1440 x 1080) and 720p (1280 x 720), and standard 4:3 aspect ratio VGA (640 x 480) and QVGA (320 x 240), stored in MOV files in H.264 format. This gives some 5 3/4 to 86 hours of recording on a 32 GB card. And it shoots still photos in four formats -- 8M (3264 x 2448), 5M (2592 x 1944), 2M (1600 x 1200), and VGA (640 x 480), 4:3 aspect in JPEG files. Plus, it includes a focus switch for shooting close-ups in Macro mode. The camera includes 128 MB built-in internal memory, plus a microSD card expansion slot for up to 32 GB. The camera has a miniUSB port for recharging the built-in (non-removable) battery, and for transferring data to a computer. The camera memory has pre-installed MediaBrowser LE software to download and edit your videos, and share online. Or you can display directly on a television via the AV or HDMI connectors. The Picsio has dedicated buttons on the back to make most functions easy to perform, including switching between Video and Still Image mode, between Recording and Playback mode, and displaying the Index (thumbnail) view during playback. The power button is also on the back, and smaller than the others, so it takes focused attention to turn on. There's also a Setup menu (press Delete and Index simultaneously). However, switching between the video and photo resolutions is a bit obscure -- press the left control ("<") twice in succession to cycle to the next setting. Compared to the Flip Mino HD and RCA EZ209HD Small Wonder, the JVC Picsio has a narrower field of view, which brings you closer into the scene. And the full 1920 x 1280 HD resolution (compared to 1280 x 720) not only gives a larger images, but also results in sharper images with more detail when scaled down to lower resolution. Of course, these small cameras still have limited optics, with a small lens and no optical zoom. And they are so light that it's easy to shoot shaky video, so you need to focus on bracing yourself -- which is why they have a tripod mount. The JVC Picaso specs actually list an image stabilization feature to reduce camera shake, though it's not discussed in the manual, and I did not see significant differences compared to other cameras. JVC Picsio is a cake-and-eat-it-too kind of device -- a pocket-size camera with many of the features of full camcorders, including shooting videos and photos, full HD to web resolutions, and even with macro mode -- all in a comfortable and somewhat snazzy design. See my Digital Camcorders Gallery for more on pocket camcorders and other digital camcoders. 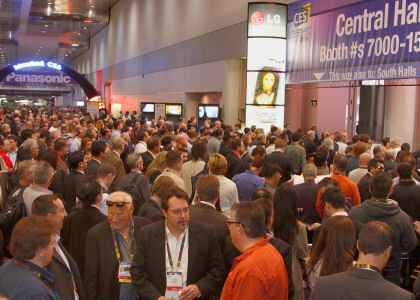 Now that CES is done, we can look forward to The NAB Show (National Association of Broadcasters), coming up April 10 - 15, in Las Vegas (see last year's post). NAB is much more then broadcasting -- it covers the broad range from content acquisition and creation to distribution and delivery. There's plenty to see and do, with some 85,000 attendees and 1,500 exhibitors. Check out the latest equipment, including cameras (e.g., Canon, JVC, Panasonic, Sony) and capture hardware (AJA, Matrox), and see tutorials on the new creative software (Adobe, Avid, but not Apple). For working pros, NAB also offers serious digital media training with Post|Production World -- five days of training on the latest techniques and practices for producers, directors, editors, designers and new media professionals, plus Apple and Avid official certification training. If you're interested in more shows, I've also updated my list of Digital Media Conferences for 2010, including regional events around New York City. AT&T and Verizon Wireless have announced new pricing plans for unlimited voice and data service. After all, we want mobile access to email and Web, and the carriers are happy to encourage more use of their networks for such data services. Consumers are moving up from plain old cell phones to multimedia phones with cameras and picture messaging and some (sometimes painful) Web and email access, and then further on up to smartphones for a more satisfying online experience, albeit on a 3- to 4-inch screen. The idea is to provide plans with bundles of minutes of talk time and megabytes of data for limited use, as well as unlimited plans for the new world of constant connectivity. (AT&T has rollover for unused minutes if not on an unlimited plan.) There are also family sharing plans for bundling service for a group of two or more phones, and friends and family options for specifying a list of favorite callers. AT&T offers separate plans for different classes of phones, plus Texting as a separate add-on, $20 for unlimited, and $30 for Family Talk. The AT&T plan for what it calls Feature Phones offers unlimited talk for $69.99 per month, and Family Talk (two lines) for $119.99. For Smartphones (including the iPhone), AT&T offers unlimited voice and data for $99.99, and Family Talk for $179.99. The texting add-on is the same. 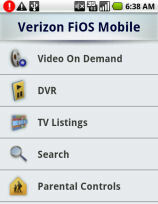 In comparison, Verizon Wireless offers unlimited voice plans with and without texting, and data plans for each type of phone. The Verizon Unlimited Talk plan is $69.99 per month, and Unlimited Talk and Text plan (text, picture and video messages to anyone) is $89.99. The unlimited Family Share plan for voice (for two lines) is $119.99, and $149.99 with text. - The two companies have matched pricing for unlimited voice plans, starting at $69[.99] for unlimited talk, and $89 for unlimited voice and text. - For smartphones like the iPhone, AT&T then adds up to $119 for unlimited voice, text, and data, or $199 for the first two lines with Family Talk. - For smartphones like the BlackBerry, Windows Mobile, and Android, Verizon now adds up to $109 for unlimited voice, text, and data, or $179 for the first two lines with Family Share. So -- If you're an existing customer for either company with a smartphone like the iPhone or Blackberry, it's time to re-price your service plan. 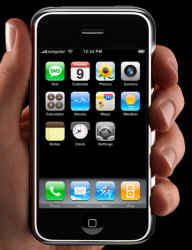 See my Mobile Communications Gallery for details on the smartphone market and products. While the obvious excitement at CES was around big screens with 3D TV, and small screens with smartphones (see previous post), there also was lots of action with new E-book readers in the middle range of screen sizes -- handheld but bigger than your pocket. There's a place in the market for these slightly larger (but still thin) devices. They're optimized for reading, but also are adding other features including general document storage (particularly with external SD cards), media playback (music and photos, although not video on E-ink displays), and Internet browsing (at least simpler static sites). The new designs experiment with new display technologies, including dual screens (E-ink and LCD -- see previous post). 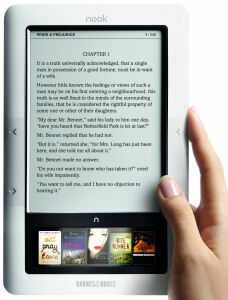 - The Sony Reader Daily Edition adds 3G wireless coverage to the Sony line. It has a 7.1" display, plus touchscreen navigation, and should be shipping this month for $399. You can download content from the Sony Reader Store and Google Books, and store on external SD or Memory Stick cards. - The Barnes & Noble Nook (shown here) combines a 6" E-ink touchscreen display with a small 3.5" color touchscreen LCD strip at the bottom for control and navigation. You can download books from B&N through the included AT&T 3G wireless, or using Wi-Fi (free in B&N stores). It's $259, with an expected ship date in mid February. - The Audiovox / RCA Lexi eReader (PDF) has 6" display, and is designed to sync via PC or Mac (not wireless). It's due in May for $229. - The Plastic Logic QUE is a bigger 10.5" reader targeted to business professionals. You can download common formats over wireless, or convert and sync office documents on the desktop. Two versions are due in April: QUE WiFi with 4 GB for $649 and QUE 3G (& WiFi) with 8 GB for $799. - The Samsung E6 6" and E101 10" E-book readers feature an electromagnetic resonance (EMR) stylus pen to handwrite and annotate directly on the display, without triggering changes by accidentally brushing the screen. The two sizes are due early this year for $399 and $699 respectively. - The Spring Design Alex E-reader (shown here) is based on the Google Android platform and features dual screens -- a 6" E-ink display for printed pages and text, plus a 3.5" color touchscreen below for general use, including full Web browsing and video playback, plus downloaded Android apps. It's due in February for $359. - The Skiff Reader has an 11.5" display using a different technology -- LG's rugged and flexible metal-foil e-paper. It uses the new Skiff Service that specializes in newspaper and magazine content, but also includes also books and blogs -- since a key backer is Hearst Corporation. It will be available for purchase later this year from Sprint. Finally, instead of dual-screen devices, we can anticipate the best of both worlds with a new dual-mode display technology from Pixel Qi. 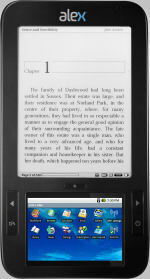 The single display switches between grayscale reflective for E-Reader uses, and color LCD with backlight for color graphics and fast video playback. The company has developed a first 10.1" screen, designed for use in mini-laptops, multitouch tablets, and E-book readers. See my Media Players Gallery for more on E-Book Readers. According to the Federal Reserve, small businesses have created 64 percent of America's new jobs in the past 15 years and employ about half of the nation's private-sector work force. But it's the ingenuity and persistence of these individuals that's really fun to see in action. For example, South Mill Design, a small company based near Princeton, N.J., has developed a wrist pouch called Phubby -- the phone cubby. 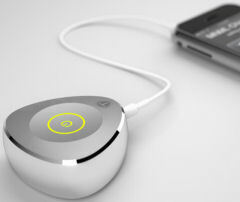 What's fun about the Phubby Sport product is seeing the thought and effort put into working the design to address the needs of today's users, especially using devices like the iPhone with larger touch screens -- but also for iPods and other portable devices. Yes, today's phones and smartphones are typically small and thin, so they can fit reasonably on your wrist. But you don't want a wrist wrap to be bulky or in the way, so the Phubby is only 4 1/2 inches long, and comes in three wrist sizes (cleverly measured compared to wrapping a dollar bill around your wrist). And for active use, like jogging or even surfing, you don't want a heavy material, so the Phubby is made from a thin Lycra / Spandex mesh fabric that breathes and can handle getting wet..
Plus, you may have other things to carry like keys, money, or credit cards, so the Phubby has two pockets, so you can carry your phone on the inside of your wrist and other stuff on the outside. Other uses for the second pocket include photographers carrying spare memory cards for their cameras. 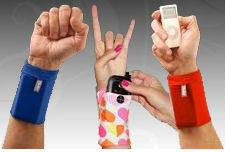 So can the phone be tucked away securely on your wrist, yet also still be easy to remove quickly? Yes, both pockets have flaps to help secure the contents, plus the phone pocket has a Velcro clasp. Then to remove the phone quickly, the Phubby label cleverly doubles as a pull-tab, so you can pop the Velcro and peel down the side to access the phone. The Phubby is a clever design, especially as active wear, but also useful for people like hospital patients who want to keep a phone and other small items easily accessible. It's available for $12.95 in a variety of colors and patterns. There's also a Hip Cubby design for $34.95. Well, the news is out -- the Apple iPad tablet has been revealed. There's a lot of instant reaction, but you'll have to wait some 3 months to actually buy the Wi-Fi version, and another month after that for the Wi-Fi + 3G version with AT&T cellular Internet data service. As usual, the keynote presentation by Steve Jobs was masterly, and the introductory video carries on the theme of "Our most advanced technology in a magical and revolutionary device at an unbelievable price." Yeesh! The iPad a beautiful device that seems to be quite smooth and responsive, with a 9.7 inch 1024 x 768 multi-touch display (vs. 3.5 inch 480 x 320 for the iPhone), though there is a rather wide bezel around the display. The size is a bit smaller than a pad of paper, at 7 1/2 x 9 1/2 x 1/2 inches, and 1 1/2 pounds. That's about the thickness of the iPhone, although a bit thicker then the iPod touch (at 1/3 inch). 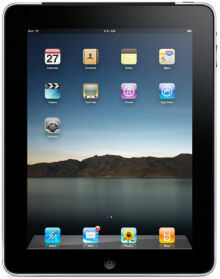 The iPad is based on the iPhone software platform, and not a notebook platform like Mac OS. 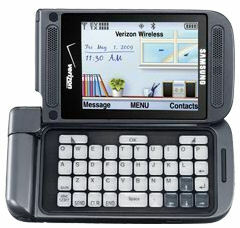 Jobs described it as "much more intimate than a laptop," so, for example, you still swipe the screen to unlock it. And the iPad runs all the 140,000-some existing iPhone apps, in a small window at the center of the screen or pixel-doubled to fill the display. Apple also says you can sync your existing iPhone apps to the iPad, so you don’t have to buy them again. Meanwhile, Apple has released developer tools to rework applications for the larger screen, and the iPad comes with 12 updated and new Apple apps that take advantage of the larger surface to view and interact with the multi-touch display. For example, the apps now use drop-down menus and pop-up context menus that don't really work on smaller displays. The resulting apps look more like laptop applications, from iPod music and Video browser / players, to Mail and Calendar and Contacts, to iTunes and App Stores -- plus the new iBookstore. And Apple has developed versions of its iWork suite for the iPad - the Pages word processor, Numbers spreadsheet, and Keynote presentations, each for $9.99. For text input, the iPad displays an almost-full-screen keyboard, although you'll need to work on finding a comfortable position to type comfortably with both hands, for example while resting the tablet in your lap. The iPad line starts with a 16 GB model with Wi-Fi for $500. Add another $100 to double the memory, to 32 GB for $600, and then 64 GB for $700. The W-Fi + 3G models are then another $130 more, 16 GB for $630, 32 GB for $730, and the top of the line 64 GB with 3G for $830. AT&T 3G service will be $14.99 a month for 250 MB, or unlimited for $29.99 -- with no contract required. Following the bigger iPod touch theme, the iPad is missing the same features that were stripped out of the iPhone to differentiate the touch, including the phone, camera, and GPS (except there's assisted GPS with the 3G model). So the real question for the iPad is whether it's the right device to compete with all those $200 netbooks that flew off the shelves over the holidays (even stacked as impulse items in our local grocery stores). Jobs was clear about his position -- "Netbooks aren’t better at anything -- They’re just like cheap laptops." And yes, what netbooks are better at is being cheap and highly portable. But netbooks also give you a lot of options that the iPad does not, including a removable battery for long trips, and a memory card slot and USB connector to back up and exchange your work with others. And they have video connectors to display directly from your device, though VGA and even HDMI for HD video. With the iPad, these will require separate adapters for the Apple dock connector. The iPad also appears to not have any new support for multitasking, which is interesting as Apple runs TV commercials promoting the iPhone's ability to run other apps as you talk on the phone. But you apparently still can't have apps running in the background checking for new information as you work or move around, and then notify you when needed. Yes, netbooks running Windows are slower than full-featured laptops as you switch between programs and run computer-intensive processing in the background, but at least you do have the option to work this way. So the iPad is perhaps more comparable to the "quick-start" modes in some netbooks with products like Phoenix HyperSpace that lets you "use your PC like a smartphone." These are typically based on a slimmed down Linux OS that starts up instantly into a reduced environment for performing a wide range of common operations including playing media, editing documents, checking email, Web browsing (and playing videos), and even Internet phone. When you limit the capabilities like this, netbooks can run quite well. Then you can switch to full Windows as needed for specific tasks, and accept the limitations of the underpowered platform if you choose to multi-task between more intensive processing. So it seems that the iPad is not a "netbook killer," at least for those who need the ability for a netbook to step up to heavier work. But the iPad certainly should be interesting to those who were looking at netbooks for only doing more basic viewing, editing, and browsing. Plus, the familiarity of the iPhone interface and depth of the Apple's merchandising (iTunes, App, and now iBook store) are much more compelling than a generic netbook with a fast-start interface. Perhaps the real bottom line of the iPod presentation was that Apple has seen over 12 billion downloads from its now three stores, and has assembled files of 125 million accounts with credit cards that can purchase from the stores. That's an amazingly powerful channel, and strong lock-in to its growing family of platforms. Entries posted to Manifest Tech Blog in January 2010, listed from oldest to newest.